Curious about what it’s like to work with a Celebrant? Read what Laura shared with me about her experience of honoring a personal transition with a ceremony. Read what Kristel wrote about the wedding ceremony I created for her and Trevor. What are your needs and goals? What kind of experience do you want to have? What are you looking for in a ceremony officiant or consultant? We’ll start with those questions and go from there. 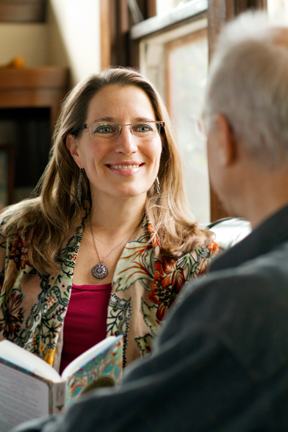 My personalized Life-Cycle Celebrant services are created in partnership with you to reflect your values, beliefs, and desires. The first step is a free, no-obligation meeting to see if we’re a good fit. The heart of a Celebrant ceremony is your personal story. Whether it’s a tribute to a beloved person or pet who has passed, the love story that led to a wedding or vow renewal, or the account of your personal hero’s journey, I will work with you to honor, witness, and celebrate the deeper meaning in your life. "You did a remarkable job of keeping us on task, giving us ‘deadlines’ and scheduling meetings to go over our progress. This not only helped in incorporating our vision, but kept us from scrambling to write our vows the night before the wedding!" ~ Kristel & Trevor H.
I’ll provide you with a set of thoughtful questions, personalized to your situation. Based on your responses, I’ll offer ideas for rituals, readings, and other elements that reflect your values and beliefs. I’ll incorporate the elements you choose into a ceremony draft and revise until we’ve got it exactly right. I’ll coordinate with ceremony participants, musicians, and other vendors, and lead a rehearsal if needed. Drawing on my 25 years of professional facilitation experience and my training as a certified Life-Cycle Celebrant, I will conduct your ceremony with confident humility. I’ll leave you with a beautiful keepsake copy of the ceremony and the memory of a one-of-a-kind experience. Perhaps you don’t need an officiant – you may want to conduct a small, private ceremony on your own – but you’d like a resource person to help you think through your response to a significant life milestone. Or you may have another officiant – for a destination wedding, for example – but like what you see here and want me to write your ceremony. I provide consultation on an hourly basis over email, phone, and Skype. I’ll make every effort to accommodate your budget. Barter inquiries are welcome. “I am learning how important it is to invest in my own growth and development. Being frugal in this regard has taken its toll and led to the neglect of my heart and soul – what is more worthy of financial investment?” ~ Laura K.
Send me your suggestions for spectacular ceremony resources. Learn more about the Life-Cycle Ceremonies I offer.